Talia Walton rises to score. Photo courtesy of UW Athletics. In just 140 characters, Indiana Fever guard Briann January captured some of the growing buzz around Talia Walton. 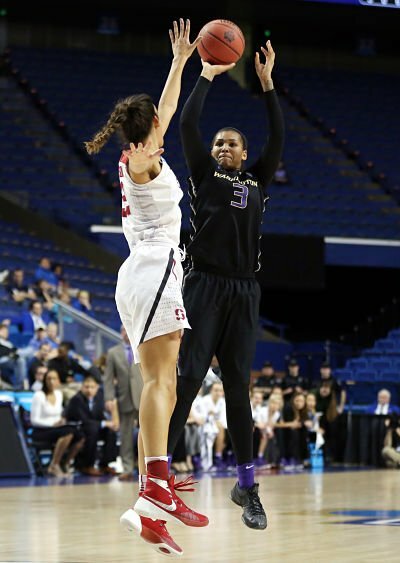 In the UW’s unprecedented run to the Final Four, Walton has increasingly caught the attention of a national audience, averaging 20 points per game — including a 30-point effort against the Wildcats in Lexington — while playing a full 40 minutes in all four Tournament games. That recognition is a far cry from the rigorous recoveries that have accompanied every summer since she’s arrived at the UW. After the end of each season, the Federal Way, Wash. native has gone under the knife, with three surgeries on her right knee, and one on her left. But Walton takes the physical hurdles in stride, saying that everything happens for a reason. And push through it she has, starting at least 30 games in all four seasons. 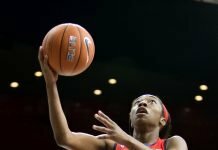 This year, she finished third in the Pac-12 in minutes played at just under 37 per night, behind only Cal’s Mikayla Cowling and UW teammate Kelsey Plum. To keep the swelling down in her knees, Walton uses plenty of ice and takes an anti-inflammatory, while keeping everything around her knees loose. Barnes said Walton has always been a versatile player, but she’s become a much better 3-point shooter, and especially this year has shown her ability to post-up when she has a defensive mismatch. It’s not as if her presence has been felt solely in her point totals either. 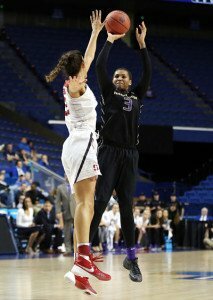 Walton finished fourth in the Pac-12 in steals with just more than two a night, and 15th in rebounds with six per game. For those that have had their doubts about her longevity, Walton said she doesn’t let it get to her. Barnes said this is the best she’s seen Walton feel, and the best she’s moved with her knees. As the team prepares to head to Indianapolis, she now gets the chance to raise her stock even further as she attempts to make the jump to the pro ranks. It doesn’t hurt to get a bit of recognition from those that have already made their way to the pros, either.